This is second part of my 'How to build ADFS (SAML 2.0) to KCD "proxy" using Citrix NetScaler' guide. On first part of this guide I said that we will join Netscaler to domain. Well I noticed later that is not needed on this configuration because any client doesn't connect to Netscaler using Kerberos authentication. Anyway here is rest of needed configurations to get this working. 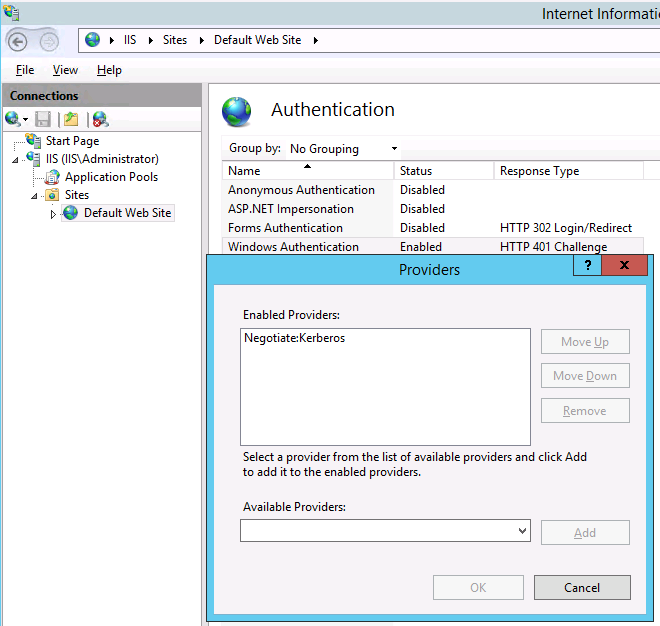 Enable "Windows Authentication" to IIS web site. Add "Negotiate:Kerberos" authentication provider and remove all others. My IIS settings looks like this. On that point it is good idea test that you really can connect to application and authentication to it works from some machine which is on same domain with backend server. 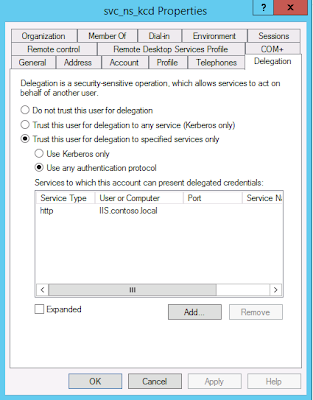 Because we are using kerberos authentication you will notice that you must connect to application using name which have registered SPN (Service Principal Names) on Active Directory. Important note here is that when you connect to this page through Netscaler, it will always use server's FQDN name to connect it. That means that even public url on this example is iis.contoso.com, you don't need register SPN for it. After you are forced IIS to use Kerberos authentication you will notice that service on Netscaler will go down (at least if you are used HTTP monitor). Reason for this is that Netscaler can't any more get right response from IIS server. To solve this issue I created "HealthCheck" folder to IIS side and enabled anonymous authentication to it. Then I created custom monitor like and linked it to IIS service. This is only needed for enabling "Delegation" tab to that service account but of course it need to unique on domain. I used nsidp.contoso.com name which was used SAML provider. When we have everything else on place we just need create KCD account to Netscaler and assign it to service using traffic policy. After you add that configuration you should be able to connect to https://iis.contoso.com using SAML federation and you should be authenticated to application using kerberos. After some testing I noticed that Netscaler got kerberos ticket only for first user and after that it authenticated second user to application using first user's credentials. Because I didn't found solution to that problem my self I created support request to Citrix. They found from log files that problem on this configuration is that Netscaler always connects to backend application using same source port, that why IIS didn't requested user authentication (using 401 error) and second user was delegated to application using first users session. Solution to this problem is set maxClient = 1 setting to service. With that configuration Netscaler always uses different source port when it connects to application. Then IIS always responses 401 to first request and Netscaler will get kerberos ticket for user. After you are used lot of time to get this working, relevant question is that "What is needed to add another vserver behind this system?" AssertionConsumerService value specified on SAML metadata. On example on first part of this guide I already included iis2.contoso.com to there. 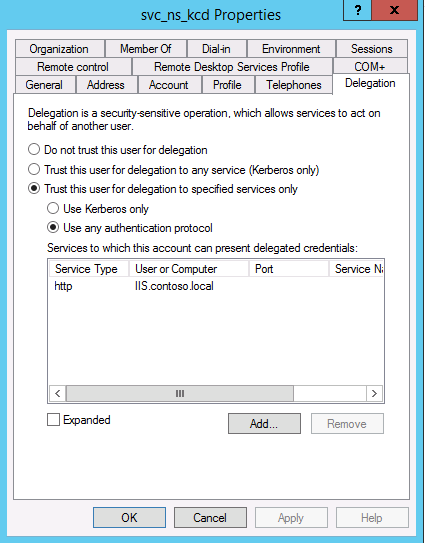 You need add kerberos delegations to new IIS server for svc_ns_kcd account. NOTE! On this configuration both of these web pages (iis.contoso.com and iis2.contoso.com) are authenticated using auth.contoso.com authentication vserver and them are using same relaying party rule on ADFS side. If you are service provider which wants publish different web pages to different customers then you need have one authentication vserver per customer that configuration allows to use different relaying parties for different web servers. It have been very nice experience to leaning how kerberos authentication and SAML federations works on deep level and I really like that Netscaler allows us to do this. I hope that this will be useful guide for people who are looking for same kind solution. My trip here is now over and it is time to move on to next technologies.